HACKGATE DAY 204: CRACKS APPEAR IN MORGAN DEFENCE AFTER CNN HOST HIT BY MILLS-BOMB – The Slog. Will Sir Paul now blow Morgan’s defence out of the water? The Slog having last weekend dubbed Piers Morgan’s former tabloid modus operandi ‘Hackmates’, the trend continued last night as former Paul McCartney wife Heather Mills told BBC2’s Newsnight programme that her phone had been hacked by a Mirror journalist during her courtship with the Beatle, that the hack concerned had admitted it, and that the hacking took place while CNN anchor Morgan was editing the Mirror. But crucially, the account of the hacked voicemail message is almost a verbatim version of that mentioned by Piers Morgan in his now much-thumbed book, The Insider. This effectively blows away the Morgan ‘never knowingly’ get-out on using stories based on phone hacking. The imputation is very clear: having admitted to playing the tape (and myriad accounts relating an office party at which Morgan jokingly referred to the tape of Sir Paul singing) Morgan must have known about its provenance. However, the fact that Mills threatened to call the police if the Mirror ran the story means it was never published. So Morgan’s ‘used’ part of the last defence line is theoretically intact. Except that (1) non-use was not his decision; and (2) knowing the phones of two major celebrities had been hacked, he did nothing about it…..more precisely, he joked about it. But there is more. The Slog has learned that in fact Heather Mills (for probably perfectly honourable reasons) has chosen not to give a full account of the couple’s total experience of having their phones hacked. There is a passage in The Insider where Morgan begins ‘my old friend Paul’ etc etc, and then relates a conversation in which McCartney has asked him to kill another story – this time based on a row in a restaurant. In fact, this is not a true reflection of what took place. The ball is thus now in Sir Paul’s court if he wants to come clean on the event. Suffice to say that this story too was based on a phone hack….although probably by another tabloid. His office has so far declined to comment on the incident. Nancy Dell’alio also confirmed to Newsnight she was sure the Mirror hacked her phone when Piers Morgan was editor. Rio Ferdinand and TV presenter Ulrika Jonsson also believe they were hacked by the Mirror group, and Ferdinand in particular has expressed interest in suing MGN on the basis of this. Last night, MGN stayed with its unchanged defence of how its journalists ‘act within the law’, a defence that is no defence at all as it is in the present tense, and these events refer to the past. The Slog strongly suspects that Operation Weeting will be ignoring these repetitions. Morgan himself issued another denial under CNN’s auspices, but it was considerably less bullish than his previous statements: this time he called the Mills story ‘unsubstantiated’….but not ‘untrue’. The problem for the Grime Parson in all this is that, unlike Newscorp – where the top management stood by (and paid off) their villains to keep a culture of criminality secret – there is absolutely no advantage for CNN in having any of this ordure rub off on them. As The Slog revealed exclusively earlier in the week, CNN Executive Vice President Richard Davis already has severe doubts about Piers Morgan. The ‘accident’ that some top CNN suits always feared appears to have happened. The bottom line is that full and final proof of guilt or innocence is no longer the issue in Atlanta. They have a brand image as a news corporation to think about: and in corporate America, that always comes first. Previous Previous post: HACKGATE DAY 203: Doubts grow over fiction maestro Louise Mensch’s email threats. ….and again District Judge Daphne Wickham seems a bit more lenient when it comes to the police. District Judge Daphne Wickham seems a bit more lenient when it comes to the police. off subject,JW, what are your impeccable sources in the ECB,the Fed,European banks,sovereign wealth funds,hedgies in Mayfair,etc. saying about market events?Does Mervyn King not notice that at one stage today even Barclays share price was down 50 percent from 12 months ago? I said in 2009 that 2008 would come again. It is coming, and there’s nothing I can do about it any more. I said in 2004 that our culture was in decline and if we do nothing about it, Britain will become a living Hell. This is happening – but we can still stop it. So I’ll unfoam, realign and move on to the incompetence of generals when all hope is lost for the rest of us. How quickly perspective is lost! — NOTW-NI-Murdoch — Were manning the ramparts, swearing on a pack of bibles (on my mother’s life) & challenging all & sundry to prove otherwise. Not to mention the egregious criminal nature of their intrusions coupled with obvious lying & multitudinous faux pas, all this merited the debilitating of this hubristic monolith. Now it’s the minnows — I can practically see you foaming at the mouth John — Take stock & realign your sights. Sorry just a tad confused here: are you saying Amanda Holden is not a decent, non-publicity seeking person? It amazes me that ordinary people who commit offences are usually dealt with at lightning speed. Witness the man who threw a foam pie over Murdoch a few weeks ago…he’s already been charged/appeared in court/convicted/sentenced to 6 weeks in the slammer. When it comes to offences by members of the Establishment and Agencies of the State, investigation deliberately takes forever (during which period the parties involved refuse to comment about it), until the public have forgotten about it and then usually results in the CPS claiming there’s inadequate evidence to prosecute. Witness the police officer who assaulted Mr Tomlinson at the G20. Despite copious irrefutable video evidence of the assault, the CPS initially chose not to prosecute the officer and only changed their mind when additional autopsy evidence was placed in the public domain and a non-prosecution risked an outcry. And consider how long the investigation took of the killing of the Brazilian before the CPS finally came out and said “no prosecution”. The whole matter could have been investigated inside one month. Anybody who doesn’t believe that our judicial system suffers from systemic corruption (at least the part of it controlled/influenced by politicians) is in denial. Amanda Holden is none of those things. The Slog is the only site so far to report on her case…and Morgan is refusing to comment on it. Live, sword, die etc etc. At its current speed, KnAkers of The Yard and Operation Weeting will have investigated everything that it’s allowed to investigate by about 2025. By which time it will probably have been overtaken by “events”. “Culture Committee not to call Morgan or MGN”-well who would’ve thunk that, apart from everyone who knew this was a get Murdoch campaign. “Honourable reasons” is not a phrase I would attach to Mills, and as for Jonsson and desperate Dell’Olio, well maybe they were, maybe they weren’t, frankly who cares. I will attach more credence to such stories if and when decent, non-publicity seeking persons come out. 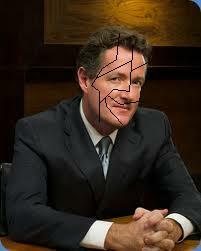 Having said that however, I am very happy that Piers Morgan’s faux grin is fast disappearing from his podgy face. A case based on the “evidence” of known publicity seekers seems not to have the soundest foundations-Mills, Jonsson and Dell’olio. The words defence, brief, shreds, rip may be appropriate. Apparently if you don’t change the standard security code that every phone comes with, then anyone can call your number and, if you don’t answer, tap in the standard four digit code to hear all your messages. I’ll change mine just in case, but it makes me wonder how many public figures and celebrities are aware of this little trick.